Next year, I’m hoping to convince them our own little party with fun food that we make is better than anything. On that note, here are some cute Halloween ghostie treats. The kids helped me make the dough, shape the dough, and sprinkle coconut on. The icing part is a bit messy. Drain the oil on top of the peanut butter into a small bowl and set aside. Reserve the oil because it may need added back later to add moisture to the dough. Place the drained peanut butter, salt, vanilla, and whichever honey style you chose into a large mixing bowl. The stand mixer works great here if you have one. 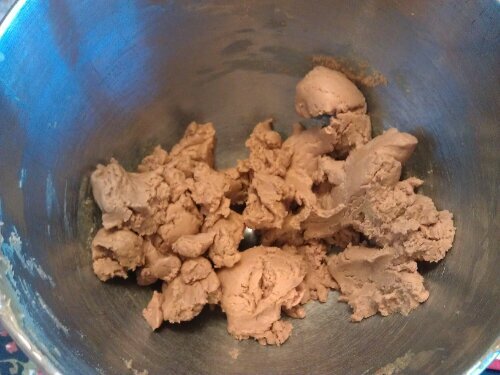 Mix the dough very well. It needs to be stiff enough to hold a shape, but not so stiff that it crumbles. (See photos below.) Mine needed no modifications, but every brand of peanut butter is different and every container of local honey may differ. Add back oil if your dough is too stiff. 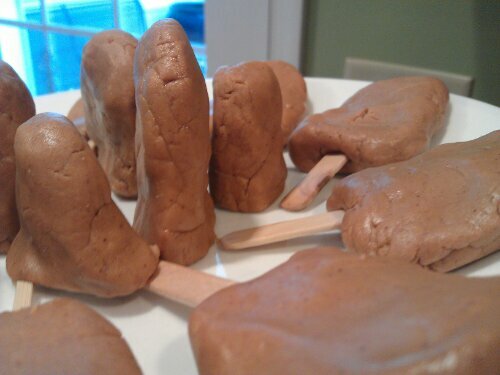 If you overshoot it and you get it too runny, you can try adding some coconut or more peanut butter if you have it. On a large cookie sheet to catch any mess, shape the dough into ghost-like shapes. They don’t need to be too smooth. You’re putting frosting on them. Combine palm shortening, vanilla, and honey in a medium bowl. Whip with a hand mixer until fluffy. The consistency will be like soft butter. Pick up and ice the top and sides of the ghosts. The icing doesn’t need to be very thickly applied, just applied all over the front so the coconut will stick. This is a messy job. Lay flat on the cookie sheet and sprinkle with coconut. Use currants for eyes and gently push in. Done this way, the currants will only stay on if the ghosts lay flat. If you think kids will want to pick up their ghosts and make them dance, you will probably want do the following step before adding the currants: Refrigerate the ghosts to firm them up, then dot some warm left over frosting where you want the eyes, and then apply currants, pushing gently. Place back in refrigerator to set the eyes. The ghosts do best presented and handed out flat on a plate. We tried sticks, but the dough wasn’t stiff enough to hold the ghost on. Bummer. The icing will be firm when refrigerated. It will soften up at room temperature. 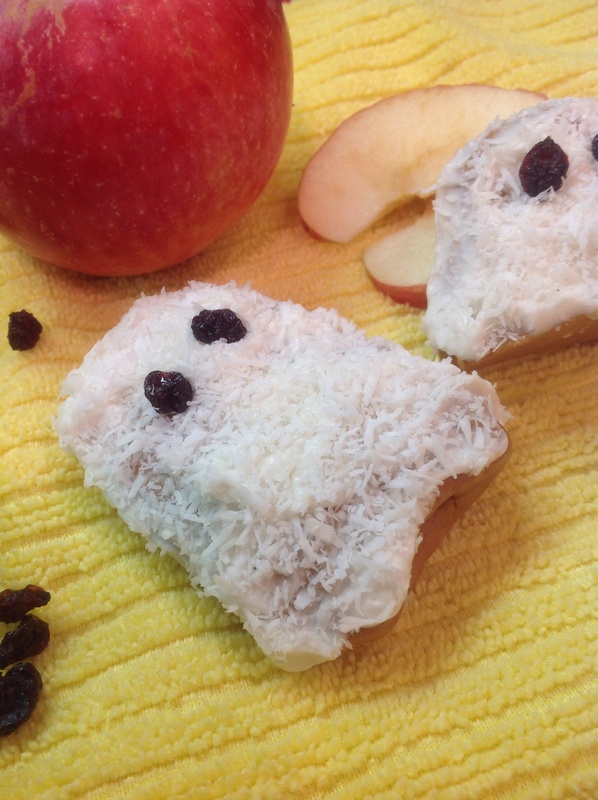 This entry was posted in Dairy-Free, GAPS, Gluten-Free, Recipes, SCD, Snacks/Preschool Snacks and tagged GAPS Halloween snack, whole food Halloween snack on October 29, 2013 by thehomeschoolingdoctor. Call me Eeyore right now. We just got about 2-3 inches of snow. Trick or treating isn’t sounding all that fun anymore. It is going to be a long, hard winter. I probably better save all of their Halloween candy in case we can’t get to the grocery store later this winter. On the other hand, let me remember who I’m talking to! It is NOT an earthquake. Yes, I think Halloween is just fine, now that I think about it. Yes, truly! Happy Halloween! Enjoy! Eat some (lots) for me! We used to have our “family meetings” in the car after church, but as our sons grew older we moved the meetings to the local Applebees after church since our kids were driving their own cars (and they would never turn down the invitation if dad was paying for their meal and the “girlfriend of the week”). Looks great, you really go to so much effort. Your kids are lucky to have you 🙂 You know my boys are going to make those ghosts dance! !